Farmington is a 14-room Federal-style home that was the center of the 19th-century hemp plantation of John and Lucy Speed. Designed from a plan by Thomas Jefferson and completed in 1816 using slave labor, the house is newly restored with original paint colors, historic wallpaper and carpets, and furnished with Kentucky furniture and other antiques from the period. 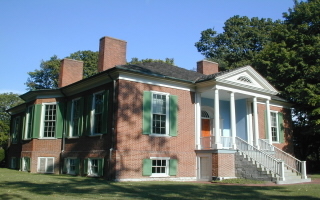 Abraham Lincoln, a close friend of John Speed’s son Joshua, spent about three weeks at Farmington in 1841. No house in Kentucky more gracefully embodies Federal architecture than Farmington. Striking Jeffersonian features of its perfectly proportioned 14 rooms include two octagonal rooms, the adventurously steep and narrow “hidden” stairway, and the fanlights between the front and rear halls. Exquisite reeded doorways, carved mantels, and marbleized baseboards add special elegance to the interior. Most of the structure, including the woodwork, glass and brass, in original and still in excellent condition.